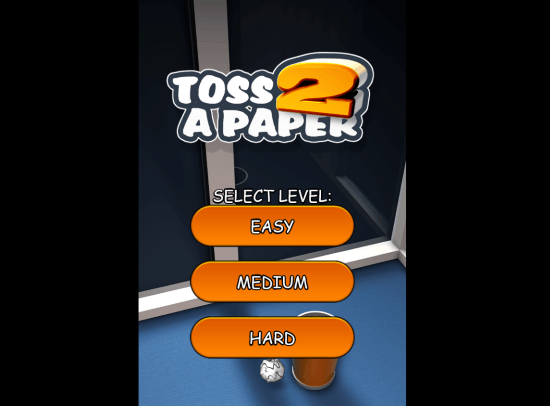 Toss A Paper is a free paper toss game for Windows 8 and 8.1 computers. This awesome time killing game is an alternative to the classic Android and iOS game, Paper Toss. Finally it available for Windows OS. This game is not the Windows version of the original game, however it resembles the original game pretty much. Bored at office, airport, or home? Do not have anything to do for the moment? Worry not! 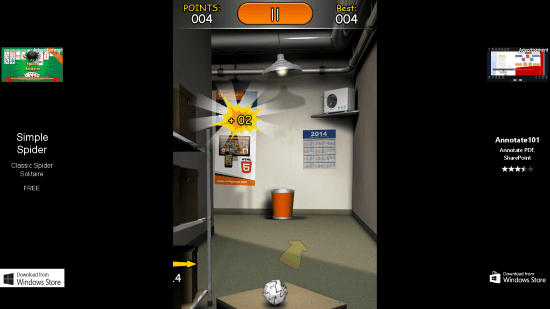 Toss the paper ball in the dust bin kept at a distance, on your mobile; just like you do when you are at work. This paper toss game for Windows 8 is not as easy as it seems. Air will be blowing in different directions to misguide your paper ball, so you have to improvise, and then shoot for the dustbin. 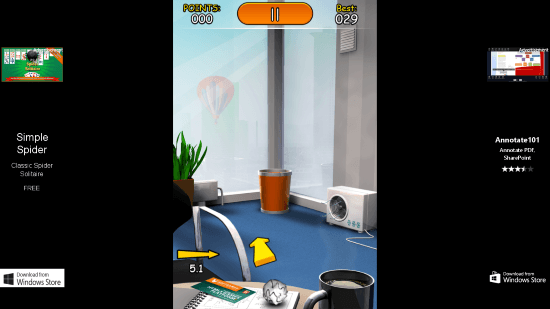 Developed by WY Studio, this paper toss game for Windows 8 has a size of 1.94 MB. To install this game, you have to go to the Windows App Store. Type the game’s name in the search box. You may also follow the download link at the bottom of the article. Click the Install button on the game’s home page. The game gets downloaded, and installs automatically. This free paper toss game is pretty easy to play. The pointer keeps moving in both right and left directions. All you have to do is improvise with the wind speed, make an estimate, and shoot. Simply click the mouse to shoot, or tap if you are using a touch device. The first level is shown in the first picture. Its an office scenario where the dustbin is pretty close. So you can aim very accurately in this level. The medium level is set up in the back office. The dustbin is a bit far. Aiming and throwing paper balls might get difficult, but you can score good. The hard level is set up in the parking. Aiming and shooting the paper balls in this level of paper toss game for Windows 8 might get impossible. It seems pretty impossible to score, but certainly is achievable. 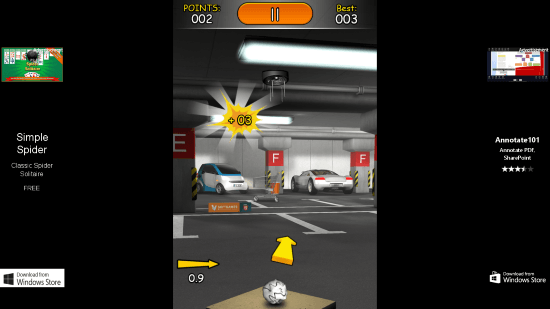 You get awarded with 1 point for each score in the easy level, 2 and 3 are awarded for medium and hard levels respectively. 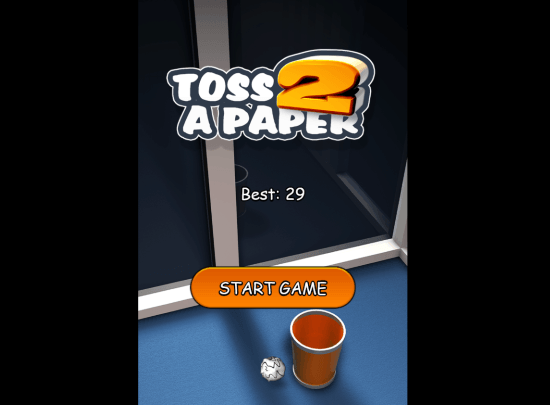 This paper toss game for Windows 8 is no less than the original game. You can play it all day long, and still can not get bored. It is one of the most addictive, time killing game. Download Toss A Paper for Windows 8 and 8.1 computers today.